Our Ready Ramps offer the ultimate value in accessibility options for your home, mobile home, or business. Custom-designed and site built, Ready Ramps provide the perfect solution to making your business or home wheelchair accessible. Ready Ramps can be built to meet ADA Guidelines; our wheelchair ramps for homes and businesses are durable and safe. Also, Ready Ramps are certified by other government agencies — including FEMA — for use in government projects and evacuation zones, so you know you can trust our ramp builders. Because of the custom nature of Ready Ramps, we encourage you to call today to set up an appointment for a free estimate. 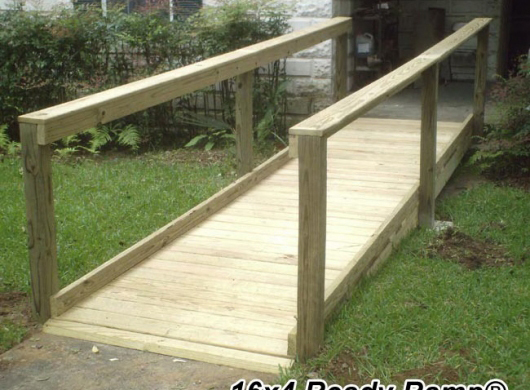 A professional contractor will come by to assess the exact requirements for your wheelchair ramp installation.